I don't pretend to be an expert on this topic. It's not like we've been jet-setting all over the place with Lara over the last year. It's just that we have had the confidence to travel, both at home and abroad, and there are a few lessons we have learned along the way that I thought I would share with you. Everyone's choice of holiday destination and accommodation is different. Just because somewhere is billed as 'family-friendly' doesn't mean it is the right place for you now just because you have a child in tow. Don't change the way you do things just because there are more of you now then there used to be. Being inside your own comfort zone will mean that the break is a lot less stressful. Our first holiday abroad was to a villa we had been to before. We knew the location, knew the facilities and the only thing that was different was the existence of Lara. If you are choosing a hotel or a cottage or a villa or bed & breakfast, the thought processes are the same. Where will your child sleep? Some hotels are happy to provide cots, but will they be of sufficient quality for your liking? If the accommodation provider won't supply a cot, will there be room for you to take your own? 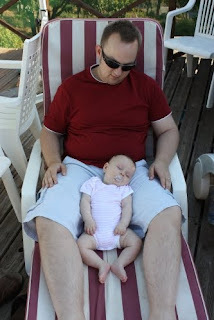 Will there be somewhere quiet, away from everyone else that your baby can sleep? 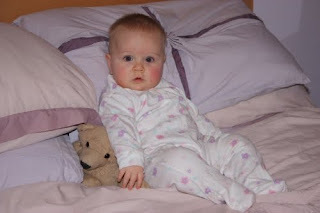 For us, we need to consider whether there are soft floors on which to rest our travel cot. If you are staying in a hotel, it is worth checking that they are happy for children to dine in the restaurant (although, I'd suggest finding a different hotel if they object!). If you are self-catering, then is there a high-chair you can use, or will you need to provide your own? Are there eating establishments nearby that will accommodate your family? Only you can judge whether the location you have chosen provides all the entertainment and facilities you and your family need or expect; so here are just a few pointers. Are there local shops where you can buy baby supplies? What hours do they open? If you want a quiet night's sleep, are there any local places that will put a spanner in the works e.g. nightclubs/bars? Will you have access to a microwave? Or to a plug socket if you need to sterilise equipment? Or will you need to sterilise in cold water? Is there somewhere clean and convenient where you can prepare or perform feeds? Is there somewhere that you can wash baby's feeding equipment? Or all of those dirty clothes? What are the bath facilities like? Will you be able to bathe your baby easily? How far is your room from the dining room, pool, car-park etc? We once stayed in a hotel where we had to traipse up several flights of stairs with Lara in the infant carrier to get to our room. Ug. If you have other tips, please add them here.